Malaria is a preventable and curable disease caused by the genus Plasmodium. In 2017, around 219 million cases were estimated, from which 435000 resulted in death. As many as 87 different countries registered malaria cases, but India and sub-Saharan Africa carried almost 80% of the disease prevalence. 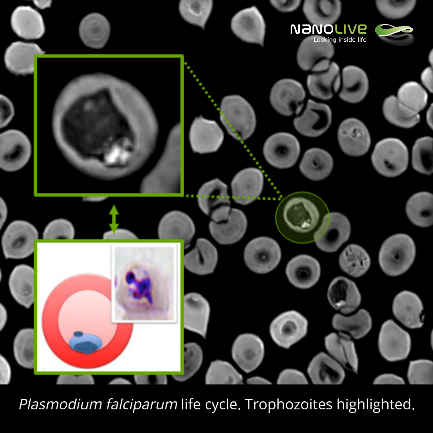 The most severe form of human malaria is caused by the protozoan parasite Plasmodium falciparum. Female Anopheles mosquitoes are vectors in the transmission of the parasite. In order to avoid misdiagnosis, which results in increased morbidity and mortality rates, the World Health Organization calls for an early, accurate and high-quality diagnosis of the disease. Currently, the diagnose is made using microscopy, rapid diagnostic tests and nucleic acid amplification-based diagnostics. Human blood is composed of plasma, red blood cells (erythrocytes), white blood cells, and platelets. By adding a drop of PBS to a drop of blood directly on a dish, the sample is ready for observation. Under the microscope, healthy human red blood cells appear as small, rounded, bright and dense structures due to haemoglobin light absorption and their lack of a nucleus (sec. 5 in the video). This sample is a good representation of human blood, as we are also able to distinguish white blood cells, most likely macrophages. In the video, we can appreciate how they move roaming to find intruders (sec. 20 in the video). 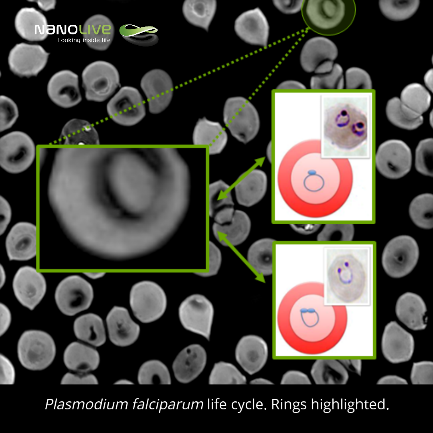 In an ideal context, once an individual would be infected with P. falciparum, macrophages would detect it and kill it, but an important immune escape strategy of malaria parasites consists in evading direct interaction of parasites and host immune cells during the erythrocytic stage by intracellular survival in host red blood cells. Internalization of the parasite in the host red blood cells entails not just avoiding macrophages detection, but also degrading huge amounts of haemoglobin. This loss of haemoglobin is visible under the microscope. In this live sample, we can compare a healthy bright and dense red blood cell (second 40 in the video) with a neighbour infected erythrocyte. Inside the infected cell we are even able to distinguish the parasite (sec. 44 in the video). During its life cycle, the parasite’s shape does not remain constant. Indeed, its life cycle goes through different stages. Classic microscope detection of malaria in blood samples involves Giemsa staining and, therefore, results strongly rely upon the experience of the technician, the quality of the reagents and the microscope. 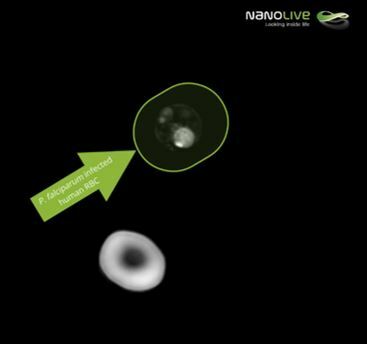 By adding a drop of PBS to a drop of blood on a smear, and covering it with a cover slip, a non-stained and, consequently, fast to prepare sample was ready to be observed under Nanolive’s holotomographic microscope. 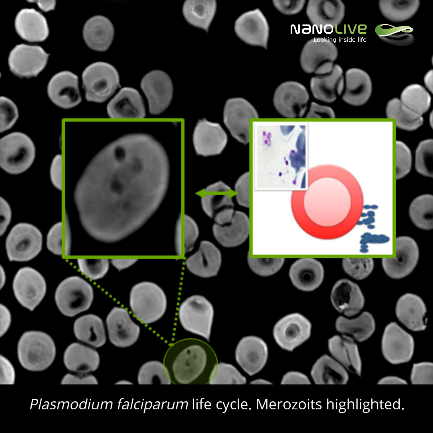 Plasmodium falciparum life cycle lasts for approximately 48 hours. The parasite enters the bloodstream once an individual is bitten by an infected female Anopheles mosquito. Sporozoites then migrate to the liver, where an invasion of hepatocytes will take place, which will give them the perfect environment to multiplicate and form merozoites (min. 1:10 in the video). 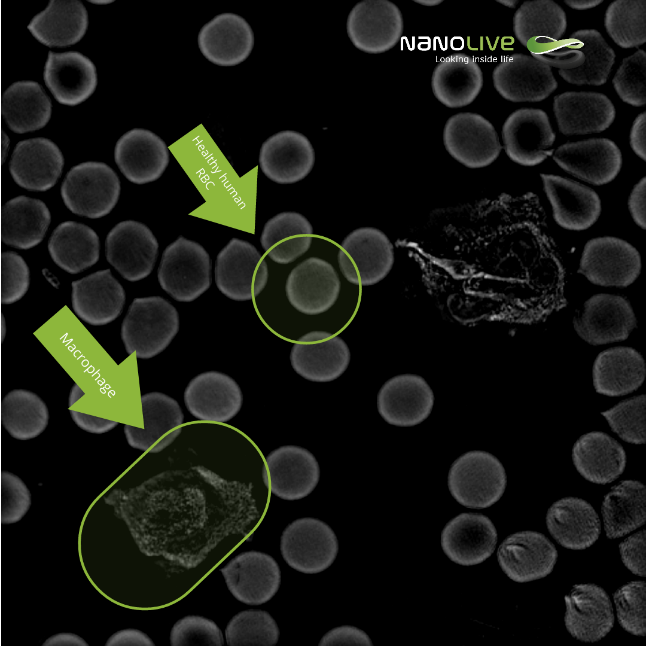 Merozoites are released back to the bloodstream, as small (0.9 x 1.3 µM), ellipsoidal structures containing a nucleus and secretory vesicles with the necessary material for the merozoite to invade red blood cells. When erythrocytes are infected and during a period of 20-24 hours, the parasite remains in a form called ring (min. 1:22 in the video). During this time, the loss of haemoglobin mentioned above occurs, as the parasite uses it to feed itself. These 2-3,7 µM in diameter biconcaval structures contain organelles and nucleus in the thicker periphery. The most remarkable cell shape modification is observed 24-36 hours post-erytrocytic invasion, when trophozoites are formed (min. 1:34 in the video). Trophozoites appear as rounded structures with a single and dark pigment vacuole that contrasts the bright periphery. 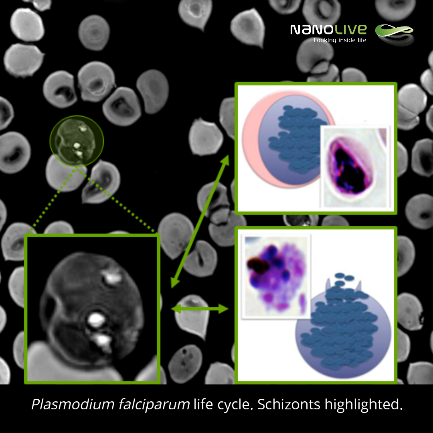 Due to the huge modification of the original red blood cell, dense material coming from the erythrocyte skeleton accumulates and the following stage of P. falciparum’s life cycle, the schizonts-phase, can be observed (min. 1:45 in the video). At this stage, the parasite is mature and nuclear division and merozoite formation takes place. Eventually, schizonts burst and merozoites are released. Released merozoites have now two options: to either re-enter the cycle or to undergo asexual multiplication cycle, needed to generate the transmissible parasite form, the gametocytes. To do so, a portion of the merozoites is released from the infected red blood cells. If a female Anopheles mosquito bites an infected individual, the gametocytes will be introduced and the parasite will use the mosquito as a vector, leading to a continuity of the cycle. Shahinas, D.; Folefoc, A.; Pillai, D.R. Targeting Plasmodium falciparum Hsp90: Towards Reversing Antimalarial Resistance. Pathogens2013, 2, 33-54.